Detail : Paul's nineteenth solo single. this record actually sold a lot more copies than many of Paul's earlier releases. The A-side was written in Scotland, originally recorded in the Virgin Islands on a yacht called the Fair Carol which had a 24-track recording studio installed ! ... and then finished off back in London. After returning to London from the Virgin Island sessions, Jimmy and Joe left the group, once again leaving "Wings" as a trio, and the B-side was recorded at this time with Paul on drums. although the front side is in colour and the B-side is a very slightly different shot, in black-and-white. The run-out groove has, "A NICK W CUT" on the A-side, and "Made in Germany". 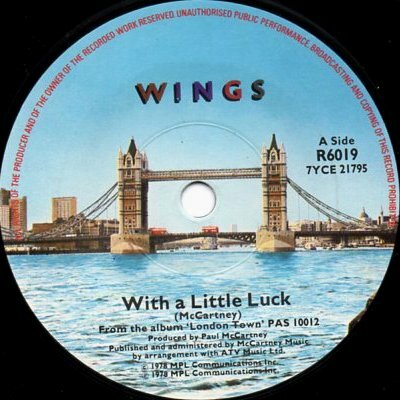 There is also a rare promo of "With A Little Luck", which has an edited version of the A-side and a demo version of the B-side ! ... this is worth more to collectors.